Reality TV fans across the nation have been starting to panic at the prospect of no more Love Island in a couple of weeks. However, we have good news! Celebrity Big Brother is back to fill the void. A new season of the Channel 5 series is on its way and, ahead of the launch, Rylan Clark-Neal has shared a picture of this year’s logo. Taking to Twitter, the CBB’s Bit On The Side host revealed the new eye design. “CELEBRITY BIG BROTHER IS BACK! Summer is about to have a storm like never before. Celebrity Big Brother Eye Of The Storm coming soon to @channel5_tv #CBB #BBUK 🎉🎉👍🏼🎊🎈🎈🎊🎊🎈👁👁👁😊🤪😜😜,” he wrote. Earlier today it was announced the new series will have an ‘Eye of the Storm’ theme. Channel 5 confirmed in a statement how the celebrity contestants entering the house will have been “caught up in a media storm”, and each will return to the spotlight with “a lot to prove”. Among the rumoured line-up is Love Island star Gabby Allen, model Talulah-Eve, TOWIE‘s Bobby Norris, Ex On The Beach‘s Charlotte Dawson, Queer Eye‘s Jonathan Van Ness, The Chuckle Brothers, Corrie actress Georgia May Foote and ex Strictly dancer Brendan Cole. Emma Willis will be returning to present the new series, while Rylan Clark-Neal will host spin-off show Bit On The Side. Celebrity Big Brother is expected to launch at some point in August. Viewers have slammed Love Island star Jack Fowler for ditching Laura Anderson and moving on to a new woman. Laura hasn’t had the easiest ride in the villa thus far. Not only did she face a dumping from Wes Nelson after his head was turned by Megan Barton Hanson, but she’s now had endure yet another rejection from Jack Fowler. Although Jack’s reasons and apology did appear quite sincere, viewers were left shocked by what was then shown in the preview for the upcoming episode. Among a series of teaser clips was footage of Jack passionately kissing new islander Laura Crane, just one day after his break-up. Needless to say, Love Island fans were not impressed by Jack’s actions and took to Twitter to express their outrage. Love Island continues tonight (Wednesday) at 9pm on ITV2. Love Island‘s Samira Mighty has spilled out the hot gossip from the villa, after walking from the series last week. Sharing her thoughts on Georgia’s decision to break things off with Sam and remain in the villa, Samira revealed: “I think if you’re happy in your relationship, and you know, there’s only like a week left, just leave. Like, don’t think about the money, just leave and you got what you wanted to go on the show for, do you know what I mean? Samira exited the villa after her love interest Frankie Foster was voted to go home. Discussing her decision on Lorraine, she said: “It wasn’t an easy decision to leave. I knew I wouldn’t win without being in a couple. I just needed to get out. “All my best friends were falling in love, and I was moping and miserable. Love Island viewers are insisting a crucial moment was edited out during Georgia and Dani’s row in last night’s episode. The two girls have always had each other’s backs in the Love Island villa, but Georgia and Dani’s friendship may have come to an end after their furious argument in Monday night’s instalment. After Georgia and Sam made the decision to stay in the villa and split up, rather than remain in a couple and go home, Dani decided it was time to confront her BFF. Dani responded: “You two have made the decision to stay in here, be single and get to know other people. I don’t think you’ve actually realised what you have done. Dani continued: “I think you made a stupid f*****g decision. you’re going to be crying, George, and you’re gonna be upset. I’m not an idiot, you will. At this point, the scene unexpectedly cut to Georgia storming off from the conversation as Dani and Jack looked shocked and enraged. Fans were left confused by the heavily edited segment. However, eagle-eyed viewers swore they saw Georgia mouth something that was muted by producers as she got up to leave, while others were convinced she might have even thrown a drink over Dani. In tonight’s episode, Love Island newcomer Alexandra Cane will go on dates with Alex George and Jack Fowler. Two new boys entered the villa last night, and so it’s only right producers brought in a girl to even things up a bit. In a first-look preview clip, the Love Island newbie is seen flirting with Doctor Alex during a romantic date for two. She says: “You had me in fits of laughter. Your twerking was pretty magnificent. It made me want to have a competition with you one day. “I feel like people haven’t really given you a chance and I wanted to give myself the opportunity to get to know you. The girls all seem pretty excited by the prospect of Alex finding a new love interest. However, when Jack receives a text telling him to go on a date too, it isn’t met with quite the same reaction. Speaking in the Beach Hut, Jack says: “It’s another test. I didn’t expect to be tested again so soon but it is one of those things. Caroline Flack has been left hurt and disappointed following her split from Andrew Brady. The Love Island host parted ways from the Celebrity Big Brother star this week after announcing their engagement in April. 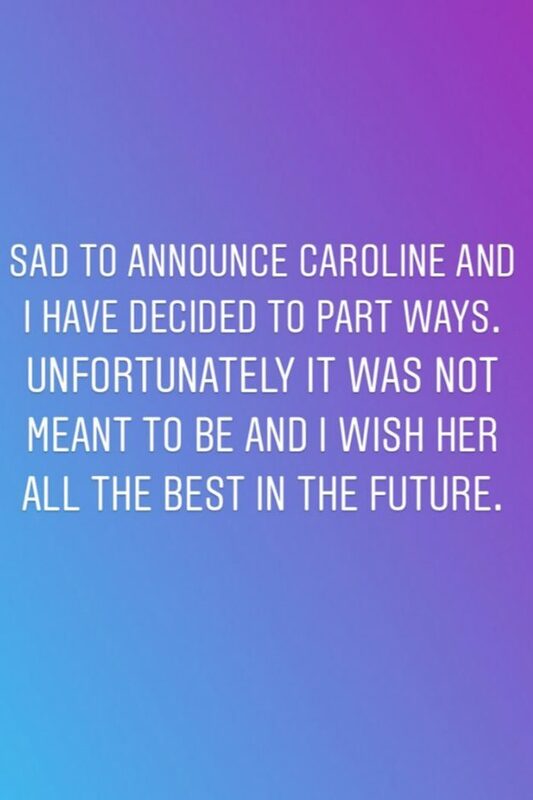 A source has revealed that Caroline has been left devastated by the split and thinks her ex is “full of lies”. They told The Sun: “Caroline is so sad about what has happened. “She’s disappointed that Andrew has decided to make this public at this stage. “She had hoped to deal with this privately. The presenter confirmed the break-up in a statement, telling The Sun: “I’m sad to announce that Andrew and I have decided to part ways. Andrew also confirmed the news on Instagram. He wrote: “Sad to announce Caroline and I have parted ways. Two Love Island contestants have officially been dumped from the island, but fear not! Another two boys are about to enter and shake things up. In a shocking turn of events, the islanders were gathered around the fire pit last night to dump another boy and girl from the villa. After facing the public vote, both Grace Wardle and Frankie Foster were forced to wave goodbye, leaving a devastated Samira on her own once more. However, we reckon she might perk up a bit when she learns of the two new boys entering the villa. At the end of last night’s episode, newcomers Idris Virgo and Kieran Nicholls were seen walking their way towards the Love Island digs. And they sure look like they mean business. The two boys have already confessed an interest in Josh’s girlfriend Kaz, which could certainly ruffle some feathers in the group. Will Kaz’s head be turned? The season six trailer for Orange Is The New Black has finally arrived. The new series sees the women of Litchfield Penitentiary moved to a maximum security prison, following the riot in season five. Not only do the group have to deal with a completely different prison dynamic, faced with a whole new set of inmates and guards, but it seems they may even start to turn on one another. OITNB season 6 lands on Netflix on July 27. Love Island‘s Adam Collard has only gone and said the L word to Zara McDermott! We never thought we’d see the day, but the villa’s main player has settled down and found love. “Are you in love?” host Caroline Flack clarified. Adam took to Instagram following his departure from the show last week. He wrote: “Everything about my time in the villa was amazing and I can’t thank everybody enough for the support both inside and out of the villa. Love Island continues tonight (Monday) at 9pm on ITV2. Tonight’s Love Island episode will see the villa erupt after Georgia’s kiss with Jack. Confessing to Laura what happened on their date, Jack explains: “When we got up to leave, I’ve gone in for a kiss on her cheek and she came in towards me straight on and she kissed me on the lips. Laura snaps: “I’m done with Georgia. I’ve been there for her but she is a little girl and I don’t rate her as a person anymore. Later, Laura comes face to face with Georgia in a heated showdown. She rages: “So you didn’t try and kiss him then? All you say is you’ve got loyalties. Taking out your best mate’s guy, telling me that it was purely because he made you laugh, then all of a sudden you fancy him, you’ve got a connection and you’re trying to kiss him. Love Island continues tonight (Friday) at 9pm on ITV2.